Fanfarlo's Simon Balthazar discusses his childhood, penchant for trumpets, and intellectual inspiration. "I grew up in a house with not many records but a lot of instruments," said Balthazar during a tour stop in Copenhagen. "No one in my family is a musician, but the instruments were just kind of around. It was a mix of things people had taken lessons on and abandoned. I would learn to play a few chords here and there, a few notes here and there — mandolin, ukulele, piano, glockenspiel. That kind of stuff was always around, so it feels natural for me to write for those instruments." Drawing attention in both Europe and the United States, Fanfarlo's 2009 album, Reservoir, is a forceful debut, a lush and ornate record that's earned the band accolades (NPR's "All Songs Considered" named it best new band of 2009) and comparisons to Arcade Fire, Neutral Milk Hotel, and Belle and Sebastian. "When I moved I got to know a lot of people who were doing music, and these songs quite quickly became something that we could start playing live even though it was quite different from what we're doing now," he said. "People who were coming to those early shows are now in the band. We put out a few seven-inches even before there was really a band. The first few were just from bedroom recordings." According to Balthazar, he had the big, orchestral sound in mind from the beginning and knew that the band had to have a trumpet player above all else. "When I first started listening to music I fell in love with the trumpet, bands like Belle and Sebastian and Neutral Milk Hotel that have taken that trumpet sound, kind of like Sixties pop or even Spanish music," he said. "So I was looking specifically for a trumpet player." Naming his band after a dancer/actress character in Charles Baudelaire's novella, La Fanfarlo, Balthazar is both well-read and a skillful songwriter in his own right. Though he admits that a tongue-in-cheek remark to Spin Magazine — "We're intellectuals" — was taken too seriously, Balthazar says the band members are all drawn to philosophy, literature, and film — any sort of artistic expression that is challenging and compelling. Though enigmatic, Fanfarlo's lyrics reflect that well of knowledge. Balthazar leans toward storytelling, often using historical characters as jumping-off points, rather than writing lyrics that could be confused for his own diary. Reading about Harry Houdini, Balthazar came across the character of Father Marcello Pellegrino Ernetti, a Benedictine priest and exorcist who reportedly claimed to have invented a time viewer. On "The Walls Are Coming Down," Balthazar uses that sense of escapism to look at reality itself falling apart as historical eras fade into one another: The preachers and books of your empire will fight here alone/Some day they will be forgotten and die one by one. The song's video even features an escape artist, suspended upside down above the band as they play on stage, shadows dancing on the back wall. Writhing and contorting, the escape artist has freed himself from a straitjacket by the time the song ends. Balthazar drew inspiration from Howard Hughes for "I'm A Pilot," sketching out those famous eccentricities as a tragic fall from grace: Like a stone, you'll come back when thrown up. But alongside that unraveling madness is a noble persistence, a belief in his inviolable essence as a pilot: If I stay in this room/They'll remember me for my youth. "Songwriting for us is something that starts as a very introspective and brooding affair," said Balthazar. "It's a quite solitary thing. I'll write songs on my own first, often sitting up at night. Then we put them together and have fun with that material. I work quite a lot around melodies more than anything else. That's why it starts out as introspective and obscure, dark lyrics and comes out as a pop song." 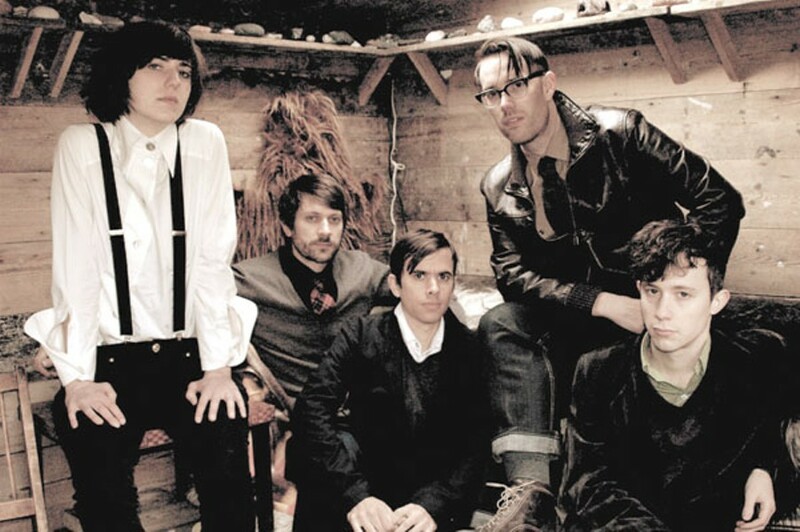 When it came time to record Reservoir, Fanfarlo whittled down a list of producers to Peter Katis (The National, Interpol), their dream choice, and took off for Connecticut for six weeks of recording in October 2008. "It just seemed right," said Balthazar. "We'd never met him, but most importantly we liked the sound of the records he made. It was important to get away from London and record in a small town in America with nothing else to do." Reservoir is 11 songs that span 43 minutes, and with buzz built from CMJ and SXSW appearances, Fanfarlo self-released the album, originally selling downloads for $1. The official, widespread release was in October 2009 as the first record from Canvasback Music's joint venture with Atlantic Records. Heavy touring in both Europe and the United States has filled the band's time during the past year. "It's important to realize the recording process and playing live are two very different things," he said. "We don't necessarily try to do everything the same way. Some songs are pretty close, other songs were recorded in a certain way because of the studio we recorded in, with lots of amazing equipment. We did work quite a lot with 10, 20, 30 overdubs of the same thing, a lot of layering of things. We have a fairly complicated live setup as well. We do switch instruments a lot, and everybody sings. To play live is to bring the music to people and to meet them before and after the show, and the room we play in dictates the sound and the mood and what we chose to play." Balthazar says he finds touring interesting, between the rhythm of the travel and the differences between the United States and European venues. Plus, there's the forced perspective that comes from living so intensely in the present moment. "You really kind of get to know yourself and the people you're with and become a family," he said. "Mentally, it's a really interesting place to be. You never really know what time of the day it is or what day of the week it is. I think you really learn to take things as they come and learn to adapt. In an odd way, you learn to focus and enjoy the here and now."